A group of women and children in Kalma camp for internally displaced people, South Darfur. Concerned about escalating tensions, the African Union-United Nations peacekeeping mission in Sudan’s Darfur region today called for restraint by all parties in and around the Kalma camp for internally displaced persons (IDPs) where demonstrations have resulted in several casualties over the weekend. “The mission continues to engage the IDP leaders and government authorities at all levels with a view to avert further violence which could only serve to undermine current Sudanese and international efforts aimed at identifying peaceful solutions to the conflict in Darfur,” the mission (UNAMID) said in a press release. On 4 September, a Sudanese police team entered the camp and drove down a road separating some of the camp’s sectors. Following that, about 100 IDPs, mostly youth, assembled outside UNAMID’s Community Policing Centre (CPC) and stoned it. As a result, one peacekeeper suffered a light injury and the premises sustained damage. UNAMID reinforcements, sent to ensure the security of its personnel, were withdrawn after a short period of time. On the morning of 5 September, a group of IDPs demonstrated in front of the CPC and subsequently commenced digging a trench to prevent access to the camp. Later in the day, some 400 people gathered near Beliel market to protest against the government. Shots were fired and several demonstrators were killed. The exact number of casualties is unknown at the moment. “UNAMID emphasizes the importance of restraint by all parties in and around Kalma and recalls the responsibility of all the involved sides to maintain the humanitarian character of the camps,” it stated, adding that IDPs must also respect the law, and refrain from criminal activities and any action that could damage prospects of achieving peace in Darfur. The mission added that government authorities must respect international and national human rights and humanitarian laws. 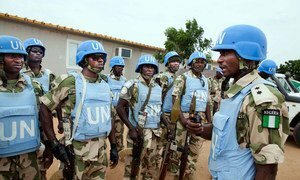 “Any disproportionate or indiscriminate use of force must be avoided,” UNAMID cautioned. The UN estimates that some 385,000 people have been displaced by the conflict between the Government of Sudan and armed movements in Darfur since the start of 2014. The world body has repeatedly called on all sides to join negotiations aimed at achieving a permanent ceasefire and comprehensive peace for the people of Darfur, which has witnessed fighting since 2003. The Security Council today extended the mandate of the African Union-United Nations Hybrid Operation in Darfur (UNAMID) until 30 June 2015, while requesting the peacekeeping mission to focus on strategic priorities such as the improved protection of civilians and humanitarian workers, along with the facilitation of aid and mediation activities.